When I asked Jensen what she would like to be for Halloween this year she told me enthusiastically that she would like to dress as "a happy witch!" and I was happy to oblige! This is my fourth Halloween of making her costume and she just gets more fun each year. We have been rather busy this year so I made it a little easier on myself by only designing and making the skirt and just decorating a store bought hat and broom. I still think she turned out as cute as can be! I found the spiderweb fabric and sparkly tulle fabric from Joann's and also got the decorations for Jensen's hat and broom from there as well. The socks are actually adult socks that I altered down to Jensen's size! We've already had a trunk-or-treat at church and then yesterday was trick-or-treating at my office. She'll get to wear her costume again on Halloween day for their party at daycare. Here are a few photos I snapped yesterday after we left my work...the temperatures dropped pretty significantly so we definitely didn't spend too much time outside since it was cool, cloudy, and windy- as you can see by how much hair is in her face in every single picture! ha! 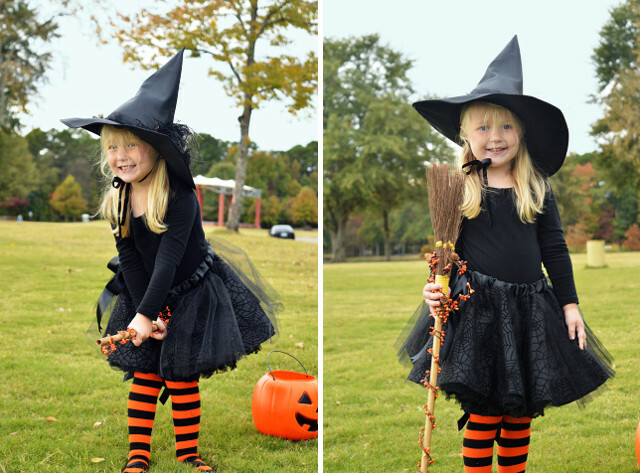 Happy Halloween sweet girl- you're the cutest witch I ever did see. p.s. Past Halloween pics here: Baby Jensen as a pumpkin, as a toddler super girl, and last year as the Morton Salt Girl!